Directorate of Information & Public Relations, Assam. 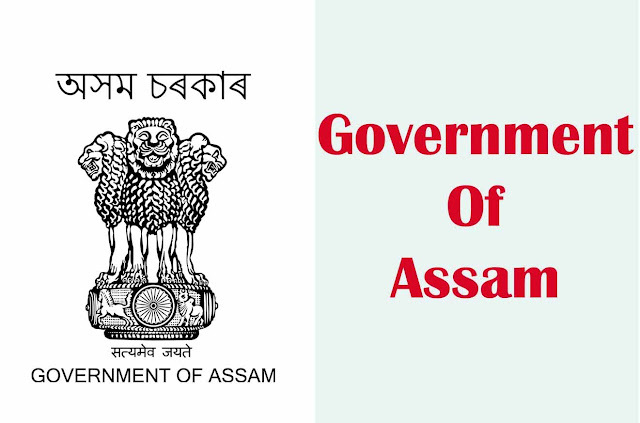 Online applications are invited from the intending eligible candidates who are citizens of India and registered in any of the Employment Exchange within the State of Assam for filling up of 49 Nos. 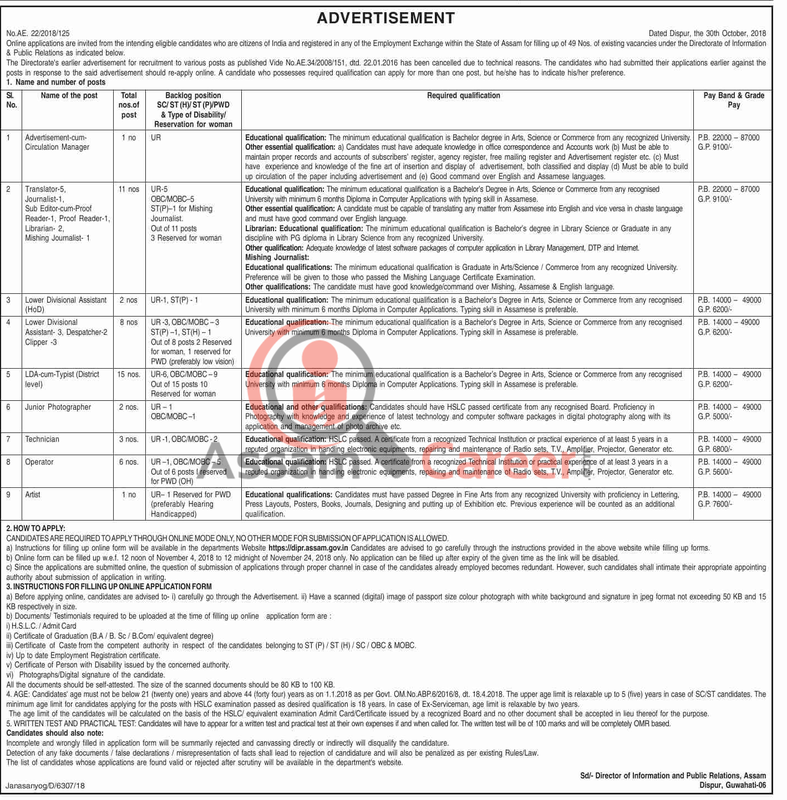 of existing vacancies under theDirectorate of Information & Public Relations, Assam as indicated below. The Directorate’s earlier advertisement for recruitment to various posts as published Vide No.AE.34 /2008/151, dtd. 22.01.2016 has been cancelled due to technical reasons. The candidates who had submitted their applications earlier against the posts in response to the said advertisement should re-apply online. A candidate who possesses required qualification can apply for more than one post, but he/ she has to indicate his/her preference. Educational Qualification: The minimum educational qualification is Bachelor degree in Arts. Science or Commerce from any recognized University. Other essential qualification: Candidates must have adequate knowledge In office correspondence and Accounts work. Must be able to maintain proper records and accounts of subscribers’ register, agency register, free mailing register and Advertisement register etc. Must have experience and knowledge of the fine art of insertion and display of advertisement, both classified and display. Must be able to build up circulation of the paper including advertisement and Good command over English and Assamese languages. Educational Qualification: The minimum educational qualification is a Bachelor’s Degree in Arts. Science or Commerce from any recognised University with minimum 6 months Diploma in Computer Applications with typing skill in Assamese. Other essential qualification: A candidate must be capable of translating any matter from Assamese into English and vice versa In chaste language and must have good command over English language. Librarian: The minimum educational qualification Is Bachelor’s degree in Library Science or Graduate in any discipline with PG diploma in Library Science from any recognized University. Other qualification: Adequate knowledge of latest software packages of computer application in Library Management. DTP and Internet. Mishing Journalist: The minimum educational qualification is Graduate in Arts/Science / Commerce from any recognized University. Preference will be given to Those who passed the Mishing Language Certificate Examination. Other qualification: The candidate must have good knowledge/command over Mishing, Assamese & English language. Educational Qualification: The minimum educational qualification is a Bachelor’s Degree in Arts, Science or Commerce from any recognised University with minimum 6 months Diploma in Computer Applications. Typing skill in Assamese is preferable. Educational Qualification: Candidates should have HSLC passed certificate from any recognised Board. Proficiency in Photography with knowledge and experience of latest technology and computer software packages in digital photography along with its application and management of photo archive etc. Educational Qualification: HSLC passed. A certificate from a recognized Technical Institution or practical experience of at least 5 years in a reputed organization in handling electronic equipments, repairing and maintenance of Radio sets, T.V., Amplifier, Projector, Generator etc. Educational Qualification: HSLC passed. A certificate from a recognize Technical Institution or practical experience of at least 3 years in a reputed organization in handling electronic equipment repairing and maintenance of Radio sets, T.V., Amplifier, Projector, Generator etc. Educational Qualification: Candidates must have passed Degree In Fine Arts from any recognized University with proficiency in Lettering, Press Layouts, Posters, Books, Journals., Designing and pulling up of Exhibition etc. Previous experience will be counted as an additional qualification. Age: 21 to 44 years. 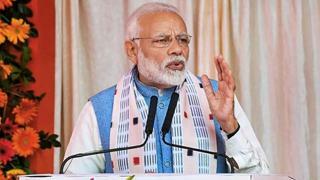 Five years relaxation for SC/ST Candidates. How to apply: CANDIDATES ARE REQUIRED TO APPLY THROUGH ONLINE MODE ONLY, NO OTHER MODE FOR SUBMISSION OF APPLICATION IS ALLOWED. 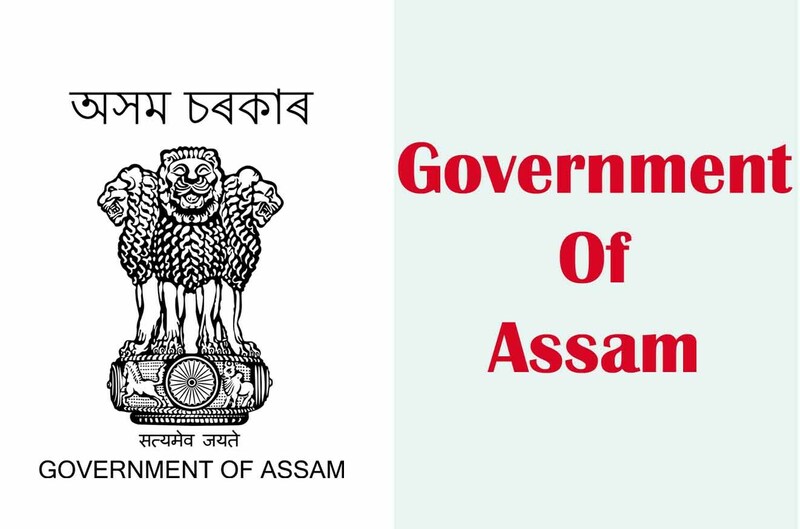 Instructions for filling up online form will be available in the departments Website https://dipr.assam.gov.in Candidates are advised to go carefully through the instructions provided in the above website while filling up forms. Online form can be filled up w.e.f. 12 noon of November 4, 2018 to 12 midnight of November 24, 2018 only.